UFC on Friday night posted a six-minute clip showing the entirety of champion fighter Conor McGregor's alleged rampage in the bowels of Barclays Center. The footage, part of the organization's "UFC Embedded" web series, captures several previously unseen angles of the rampage that ended with the arrest of the famed fighter and fellow brawler Cian Cowley on assault charges from with what appears to be to be professional-grade audio and video equipment. The video was shared on UFC's Twitter, YouTube and Facebook pages. "An unforgettable moment in time," UFC said in a tweet accompanying the video, which contains multiple profanities and the bloodied faces of two fighters. The footage opens with multiple angles of McGregor banging on the side of the bus as he shouts "smash the windows!" and "get out!" amid a barrage profanities. Another camera aboard the bus catches the Irish fighter in the center of the frame as he chucks a hand truck through the window of the bus. Yet another angle shows fellow fighter Michael Chiesa saying "dude, what the f---?" as he looks on at the chaos, blood spurting from his head. Reed Harris, UFC's VP of athlete development can then be heard asking , "who are these guys?" and several respond "Conor McGregor." "What the f--- is wrong with him?" Harris replies. The footage cuts back to the exterior of the bus, where McGregor and his entourage run out of the garage, whooping and hollering. Back inside the vehicle, cameras capture Harris telling UFC president Dana White that McGregor had "just attacked our bus" and mentioning that Ciesa was "cut really bad." The rest of the footage, which included a ticker promoting UFC 223 throughout, focuses on athletes' reactions to the occurrence. The video has already angered some fans upset that the organization is using the fracas to promote its upcoming event. And others took to Twitter to muse on whether McGregor's actions were part of a stunt because of the number of camera angles and quality of the footage and audio. White denied claims the rampage was a stunt, telling TMZ on Friday "I can't believe it's real and that it actually happened." "I'm seeing tons of dummies out there saying this is something staged," White said. "That's the dumbest thing I've ever heard in my life." NBC 4 New York has reached out to UFC seeking additional comment on the video. 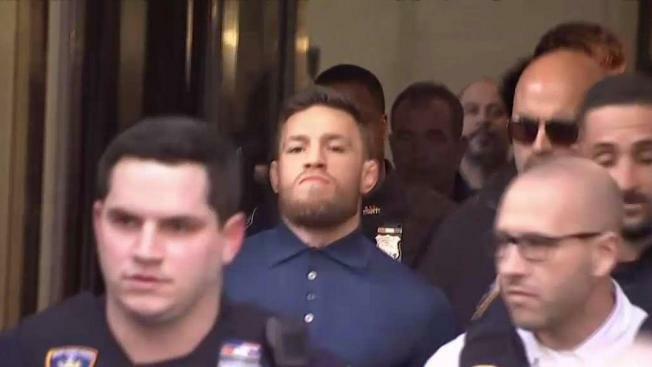 The video's release comes just hours after McGregor and Cowley were arraigned on assault and criminal mischief charges and ordered by a judge to stay away from several men they allegedly assaulted in Brooklyn the day before, including fellow fighters Michael Chiesa and Ray Borg. 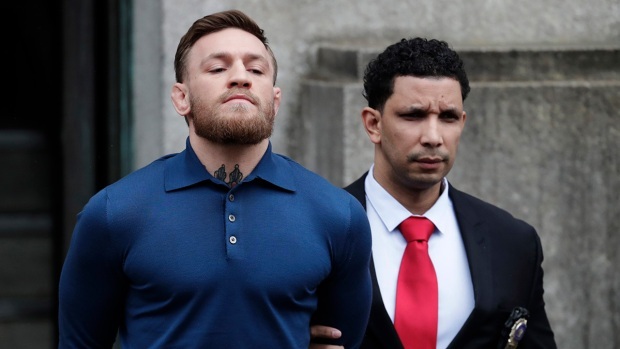 McGregor received a $50,000 bail package that would let the Irish fighter reclaim his passport, provided he checks in with his bail bondsman weekly. Cowley got a $25,000 bail package. The two men, who are next scheduled to appear in court on June 14, said nothing as they left court to a packed crowd of reporters, fans and spectators outside and got into a white SUV that whisked them away. In a statement Thursday, UFC called the disruption "completely unacceptable," and is "working on the consequences." Chiesa, meanwhile, tweeted he had been pulled from UFC 223 bout against Anthony Pettis by the New York State Athletic Commission. Flyweight fighter Ray Borg, who appeared to be bleeding from the eye in the footage, was also deemed unfit to fight. "I’m devastated to say the least," Chiesa said in the tweet. It remains unclear what McGregor was doing in New York or at Barclays Center; White speculated that he may have been in town to watch the upcoming fight Saturday.